Hi, does Firefly have HDMI-CEC capability?? I see we can get HDMI EDID from this thread:? Is HDMI CEC accessible from the same, i2c bus? What else?is necessary for HDMI CEC? hdmi : add cec support. Come on! Please somebody make an easier guide with photos on how to enable CEC. It should be enabled from factory. If you want to sell your product and make it mainstream like raspberry, you have to make it accessible also to not so advanced users. It has the potential to be a powerful product but you have to give features like CEC to the people. Make it easier for the people to do simple stuff like CEC remote controlling, running openelec, working linux flawlessly. XBMC crashes also on android, VLC crashes, thankfully MX player works well, gigabit ethernet doesn't work well. The board is still in beta phase. You give the hardware but not the software yet to make it a great product. I understand this needs work and time but you have to do this if you want to sell more and have the success of other similar products. Will the next board revision have this implemented in hardware? - Is HDMI-CEC really working? Or are there any problems with Rockchip or Firefly reference boards? Has anyone gotten this to work ever? We have all the CEC extra hardware parts mounted, checked the commit and yet no CEC signals/funtionality on the SW side. We check to the latest commit and reviewed the code, drivers, make files and a potnetial CEC/HDMI flags, and yet unable to make it work or at list have any signs of life on the CEC bus or drivers. We had invested several days on the CEC effort trying unsuccessfully to make it work, We will really appreciate any information that can point us to the right direction to make it work or documentation to continue to develop CEC.. I just searched a lot and finally found this post about RK3288 CEC for HDMI. Can you guys please explain a little bit more how exactly we should enable CEC to work with HDMI on our device? How we should solder them and do we need to add all the changes in mentioned commits by our self and recompile the kernel again? Does the CEC include by default or not? hdmi_cec = <0>; to hdmi_cec = <1>;and recompiled the kernel. So, I have flashed the new generated "kernel.img" and "resource.img" into my RK3288 device and nothing happened. Can you PLEASE let us know how we can enable CEC for HDMI? What I have done wrong which the CEC didn't get enabled? Should I do anything else to make it works? 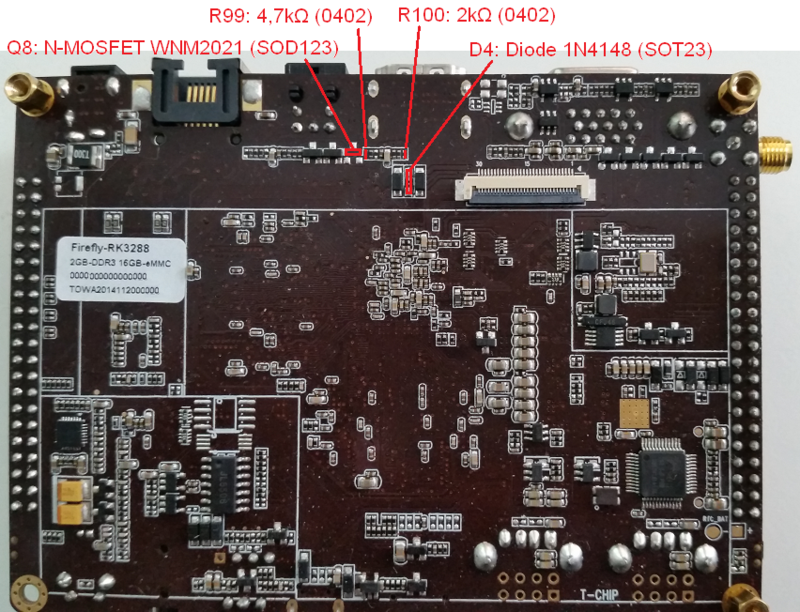 I made a picture of the hardware modifications, including infos about the electronic parts, see .